POHAKULOA TRAINING AREA, Hawaii – Army officials are opening several training areas for bow hunting, here, July 3-5, from 5 a.m. to 7 p.m.
Training areas 1-6, 9, 12-16, and the unfenced portion of training area 18, will be open for bow hunting of mammals only. 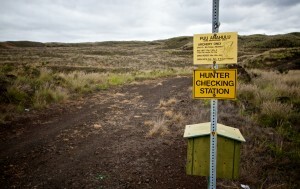 All hunters must check in and check out at one of the following hunter’s check-in stations: Kilohana, located on Saddle Road between mile markers 43 and 44; Pu’u Huluhulu, located at the intersection of Mauna Kea Access Road and Saddle Road near mile marker 28; or Pu’u Anahulu, located on Mamalahoa Highway (Hwy 190) across from mile marker 15. Checkout time is no later than 7 p.m. each day. Hunting passes will be provided at check-in stations beginning Thursday after 5 p.m.
Hunter access is through any of the following: .Training areas 1-6: Accessible by foot only from the parking lot at the Old Saddle Road Gate across from the Mauna Kea Recreation Area. .Training areas 9, 12-16, and the unfenced portion of 18: Vehicle access is through the Ahi Gate at the 38.5 mile marker on New Saddle Road. There is no vehicle access allowed east of training area 9.